From the author of Blind, a heart-wrenching coming-of-age story set during World War II in Shanghai, one of the only places Jews without visas could find refuge. Warsaw, Poland. The year is 1940 and Lillia is fifteen when her mother, Alenka, disappears and her father flees with Lillia and her younger sister, Naomi, to Shanghai, one of the few places that will accept Jews without visas. There they struggle to make a life; they have no money, there is little work, no decent place to live, a culture that doesn't understand them. And always the worry about Alenka. How will she find them? Is she still alive? Meanwhile Lillia is growing up, trying to care for Naomi, whose development is frighteningly slow, in part from malnourishment. Lillia finds an outlet for her artistic talent by making puppets, remembering the happy days in Warsaw when her family was circus performers. She attends school sporadically, makes friends with Wei, a Chinese boy, and finds work as a performer at a "gentlemen's club" without her father's knowledge. Rachel DeWoskin spent her twenties in China as the unlikely star of a nighttime soap opera that inspired her memoir Foreign Babes in Beijing. She is the author of Repeat After Me and Big Girl Small, which received the American Library Association's Alex Award for an adult book with special appeal to teen readers; Rachel's conversations with young readers inspired her to write her first YA novel, Blind. Rachel is on the faculty of the University of Chicago, where she teaches creative writing. She lives in Chicago with her husband, playwright Zayd Dohrn, and their two daughters. 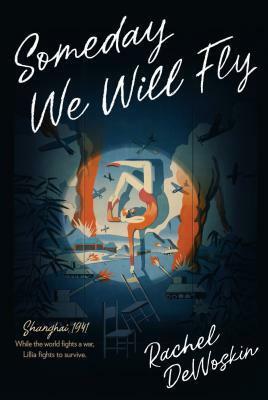 Rachel and her family spent six summers in Shanghai while she researched Someday We Will Fly.